In April 1998 London & Country bought DFD001-013 for use on route 85 (Putney Bridge Station - Kingston), displacing big Volvos. They were unusual - for London at the time - in being on DAF DB250 chassis, this being one of the successors to the MCW Metrobus chassis. Bodywork was the dual-doorway Northern Counties Palatine II, as seen commonly on contemporary Volvo chassis. They appeared in the new national Arriva livery of turquoise and champagne, and went to work from Leatherhead garage. But they were not to stay with London & Country long. In 1999 Arriva reaped the whirlwind of London & Country's cheap purchase. London & Country had not bought its garages when the company was split off from London Country. The garages were bought by a separate company, which leased them to LCSW. Now the garages were being sold off for development. Without Leatherhead garage to operate from, the 85 was a nonsense for Arriva. As a temporary measure they rented space at Fulwell Garage, which they operated as an outstation, with the DAFs serviced at Croydon. As part of their renumbering scheme the DAFs also became 6201-6213. 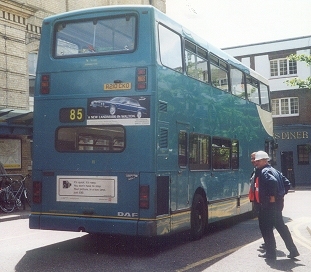 DN10, still in Arriva blue, operates the 85 for London United at Putney Bridge Station in June 2000. 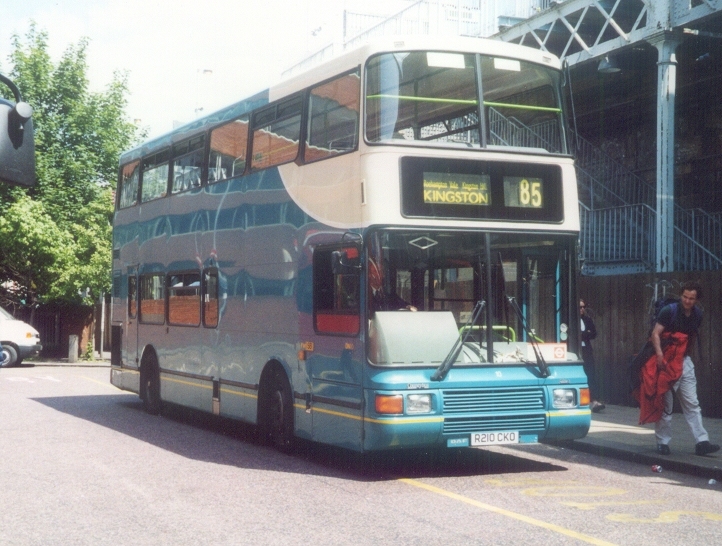 In September 1999 Arriva passed the route on to London United, who also took twelve of the buses on lease. The remaining bus, DFD013, was transferred to Arriva London North, to join its single door brethren as DBS14. They stayed with London United until July 2002. In the meantime some were repainted in London United's red with pale grey uppers, dark grey skirts and white carriage lines - one of the better London liveries. 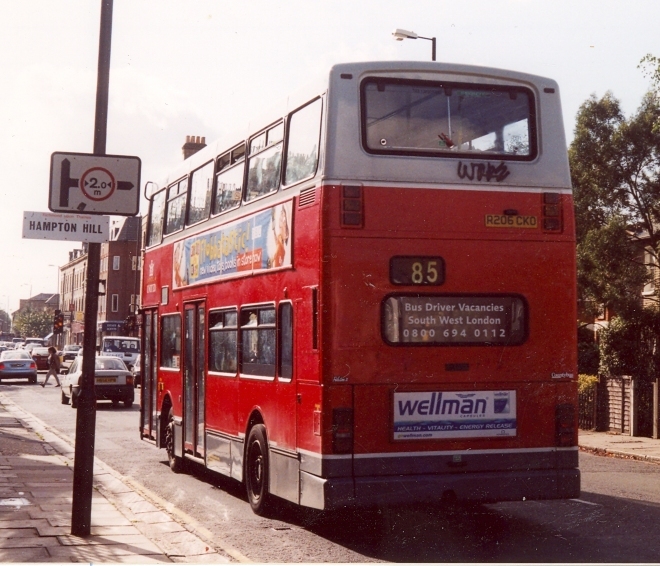 They worked from Fulwell Garage, still on the 85, although they put in occasional appearances on other routes, including the 267, R70, 131 and 71. London United returned them to Arriva in July/August 2002 when LU lost the 85 to London General. 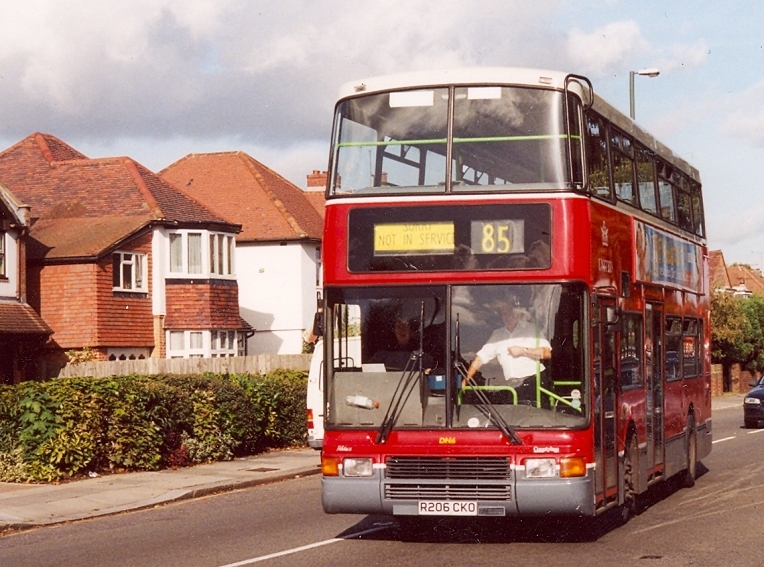 DN6, now in London United livery, is off-route in Teddington in October 2001. The first three went to Arriva Medway Towns at Gillingham, where they became 6201-6203, and were repainted in interurban blue and cream horn livery for the Medway-Bluewater services 700/701. DN4-DN12 went to Arriva Kent & Sussex at Tunbridge Wells, where 6204-8 began to be repainted into Arriva red/cream scoop, to enable them to replace the dedicated Olympians on the 402, although their red London United livery immediately qualified them for this TfL duty! I never actually saw any of them on this run, continuing to see Olympians on the rare occasions that I saw a 402. 6205-6212 regained turquoise and cream for Tunbridge Wells' other duties. 6201-3 went off to Arriva Merseyside in June 2004, and 6204-9 went to Arriva Durham County in April/May 2006. 6210-6212 have remained at Tunbridge Wells, back in turquoise/cream, used on the Maidstone-Tunbridge Wells service 7.